Resene has an extensive range of Environmental Choice approved paints that have been independently verified, including no added VOCs and an extensive range of low VOC products. 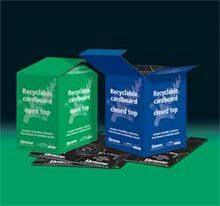 Once you have finished decorating, return your unwanted paint and paint packaging to the Resene PaintWise recycling and product stewardship programme and let us take care of them for you. Or if you prefer to get someone else to do the work for you, hire a Resene Eco.Decorator. Resene Eco.Decorators are a nationwide network of environmentally responsible, quality focussed painting contractors so you can hire them to complete your decorating projects with the confidence that the contractor is committed to sustainable work principles in their work processes. Since 1946, Resene has forged a reputation for manufacturing products designed to meet the demanding standards of architectural and building professionals. Today, that reputation is the cornerstone of Resene’s continued success. Since the 1950s introduction of waterborne paint to a market starved of quality products, Resene has developed an extensive range of quality paints and specialist coatings. Many have set new standards for other manufacturers within the paint industry and all are the result of intensive innovative thinking, research and testing. Along with the technical innovation, Resene has always been keenly aware of the need to reduce the risk products may present to decorators and the environment, long before it became topical. Not only did the basic innovation of Resene waterborne paints reduce the level of toxic solvents, but other steps such as the removal of lead from Resene decorative paints in the late 1960s have been well ahead of their time. As paint ingredients have been identified as causing concerns for health, Resene has always immediately put into place research to identify safer paint ingredients. Imagine if you can using a vermilion paint coloured by pigments made from a mercury compound to paint your bathroom, or perhaps choosing a green paint containing arsenic to finish the fence painting. Both scenarios are ridiculous to contemplate today, yet were commonplace a century ago. Paint manufacturing has certainly come a long way since then, with toxic substances such as mercury, arsenic and more recently, lead, no longer acceptable ingredients in the paint chemist’s repertoire. These restrictions are just the tip of the iceberg. Recent attention has focused on the effect of volatile organic compound (VOC) emissions on our environment. It is estimated by the Paint Quality Institute that 10% of the ozone depleting substances in the urban United States are a direct result of VOC emissions from surface coatings, including mainly standard household paints. Paints are manufactured using a wide range of organic and inorganic materials. They can contain components that can impact adversely on the environment at different stages of the product’s lifecycle releasing solvents and toxic substances during production, application, the service life of the coating and disposal. In response to growing concerns over VOC emissions, the Environmental Choice programme focuses on the need to reduce these emissions. Solventborne paints release significantly more VOCs per litre than waterborne paints, spurring Resene chemists to develop waterborne replacements for solventborne products. Trim, joinery and wet areas were traditionally no-go areas for waterborne paints due to a tendency to soften under prolonged exposure to moisture and poor block resistance (the ability of a paint to not stick to itself when two painted surfaces come into contact). Resene’s introduction of waterborne enamels in 1996 - Resene Enamacryl and Resene Lustacryl - was a breakthrough offering a viable alternative to solventborne products. Less than five years later, Resene Enamacryl and Resene Lustacryl easily outsold their solventborne equivalents. The waterborne enamel range has now been extended to include Resene SpaceCote Low Sheen and Resene SpaceCote Flat for interior use on broadwall and wet areas. Focused research and development led to already low odour Resene Zylone Sheen being launched in a no added VOCs version in 2007. Resene Zylone Sheen Zero combines all the benefits of the popular Resene Zylone Sheen with no added VOCs. Resene also pioneered Resene tinters with no added VOCs enabling a full spectrum of colours to be achieved without adding unwanted VOCs. Resene has provided paint specifications and systems to a wide range of Green Star certified projects, drawing on the extensive Resene range of Environmental Choice and low and no added VOC paints. Our commitment to initiatives such as Environmental Choice and continued investment in research and development will ensure that safer, professional quality paints are available to everyone and that the potential detrimental impact of paint wastes is minimised. Resene is committed to making sustainable products, homes and buildings available to all. Intensive ongoing research will also enable us to offer you an even greater choice in selecting paint systems. 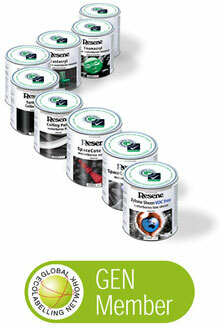 In our quest for excellence, Resene will focus on providing premium quality paints that are safer and less hazardous. That is why Resene paint truly is, the paint the professionals use. Resene is well-known for its role in introducing waterborne paint to the local market in the 1950s and for its groundbreaking move to remove lead from its decorative paint products in the late 1960s. Joining the Environmental Choice programme in 1996 was another logical step, reaffirming our commitment to the environment. Joining the Environmental Choice programme also gave Resene the impetus to solve a common headache for customers caused by strong smelling paint, by removing virtually all odorous material from popular Resene interior finishes, such as Resene Zylone Sheen giving high quality products without strong smelling solvent odours. The end result? Decorators can paint interior areas and put the area back into service almost immediately, rather than waiting for days for the strong smelling odours to disappear. The incidence of headaches, asthma, nausea, respiratory complaints and allergic reactions can also be easily reduced by simply choosing to use a low odour paint. While Resene paint odour levels are not high, the patented low odour technology provides more pleasant working and living conditions for those sensitive to paint odours during painting. The second part of the solution was to introduce waterborne products that could be used in place of solventborne products, such as Resene Enamacryl and Resene Lustacryl . Today these products have been joined by Resene SpaceCote Low Sheen and Resene SpaceCote Flat waterborne enamels bringing enamel style toughness to interior broadwall and wet areas without the unwanted solvents and high sheen levels associated with solventborne paints that were previously used in these areas. With these products, decorators reap the benefits of easy water washup, lower odour and a fraction of the VOCs of the solventborne products they were traditionally forced to use for wet areas, trim and joinery. Our policy covers a comprehensive range of waterborne primers, undercoats, topcoats, pigmented and clear coatings, mastics and specialised waterproofing and textured coatings. Resene can offer an environmental choice for almost all painting situations. Our Environmental Choice products are from the existing range of Resene paints, confirming our commitment to quality and reaffirming that you don’t need to sacrifice quality and sustainable product performance to get an environmentally preferable option. Resene products are formulated with high quality ingredients and manufactured to strict specifications then tinted when required with highly concentrated Resene tinters with no added VOCs to provide desired colour solutions without significant loss in paint performance. The quality of the tinters and tones allows the same spectrum of colours to be supplied for both interior and exterior use with most colours requiring only two topcoats to cover. Improved working environments lead to improved concentration levels and a greater feeling of well-being for decorators, as well as placing less stress on the body’s natural defences. Improvements in the quality of the working environment benefit those who are most at risk through handling the product every day. This is highlighted by the inclusion of the Resene Decorator trade range of paints in the Environmental Choice NZ programme. Compliance to the heavy metal requirements of the Environmental Choice programme, as practised by Resene for decades, also avoids possible poisoning of people, animals, food chains and environment. Just as our customers call Australasia home, so do we. Therefore it is central to our way of operating that we continuously strive to reduce the adverse effects of paint on the environment. Choose to specify and use Environmental Choice products wherever you can and help keep the environment green. Look for the EC logo on our product data sheets and paint containers - it is confirmation that the product meets the requirements of the Environmental Choice programme. All Resene products are manufactured under a Quality Management System as complying with ISO 9001 and ISO 14001. Most Resene Environmental Choice products are approved by the Australian Paint Approvals Scheme (APAS). Resene has for many years actively improved the sustainability of our products and systems and now we are reaching out further to painting contractors with the new Eco.Decorator programme. The Resene Eco.Decorator programme has been designed to recognise a nationwide network of environmentally responsible, quality focused painting contractors. Painting contractors can choose to undergo assessment for the Resene Eco.Decorator programme, which will include assessments of principles in practice, sustainable work practices, waste management, project plans and project sign off processes. Successfully meeting the standards will enable contractors to promote their business as a Resene Eco.Decorator enabling specifiers to request the services of an Eco.Decorator to complete sustainability focused or Green Star NZ projects with the confidence that the contractor is committed to sustainable principles in their work processes. Recognising that environmentally friendly products are just one piece of the sustainability matrix, Resene launched the Resene PaintWise programme in 2004, focusing on delivering unwanted paint and paint packaging recovery services and education to minimise the impact of paint wastes on the environment. Over 3 million packs have been collected. Of this over 400,000kg of steel has been recycled and over 200,000kg of plastic. Over 500,000 litres of solventborne paint has been sent to solvent recovery and over 250,000 litres of paint has been donated to cover graffiti and other community projects. Other waterborne paint is being used and held for the PaintCrete application where waste paint is used as an additive in concrete manufacturing. The Resene PaintWise product stewardship programme is accredited by the Ministry for the Environment. The programme doesn’t stop there though. The Resene PaintWise service is continuing to grow to make paint and paint packaging recovery a reality for more and more paint users. Resene distributes the Resene disposal kit for those who prefer to treat their unwanted paint at home. 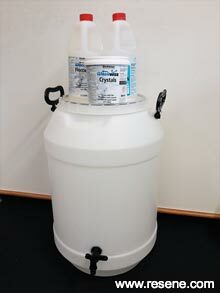 Simply mix in the disposal kit material and allow to dry then the paint can be safety disposed of with normal rubbish. Resene strongly believes that it is better to apply a high quality product that will last than apply an inferior product that will break down faster impacting on the environment and requiring more frequent maintenance and repainting. Tailoring products to conditions allows Resene to provide a comprehensive range of paint system solutions from products through to accessories to ensure the paint system performance and lifetime is maximised, including a specialist range of primers and sealers to treat the surface conditions prior to the application of the desired topcoats. Focusing on fit for purpose and delivering paint systems that work with the substrate and the environment means things get done right first time, minimising wasted resources when the wrong paints are specified or applied. Resene critically evaluates key raw materials and the manner they are sourced and is prepared to pay a premium for ingredients that have demonstrably least impact on the environment, such as titanium dioxide purchases that could be sourced from developing countries with more wasteful processing techniques, but instead are purchased more expensively from manufacturers who use least waste methods. Resene wash solvents are recycled to avoid waste while waterborne factory wash water is reused as a priority and what cannot be reabsorbed into the manufacturing process is treated in a specialised plant. And Resene is developing new paints based on raw renewable materials, such as Resene Earthsense. Sustainability is more than just green products and sustainable product performance, it is also focused on effectively and efficiently conducting business while minimising negative impacts on the environment. Resene continually works to improve all site operations from providing secure bunding in the main factory site to having individual spill kits available in Resene ColorShops to ensure any accidental spills are quickly contained. Resene innovations, such as waterborne enamels, highly durable Resene tinters with no added VOCs and the Resene CoolColourTM range, all improve the durability and performance of the paint system. Resene CoolColour technology formulated into exterior paints enables them to reflect heat that would normally be absorbed, reducing stress on the substrate and coating, while minimising the air conditioning required to keep the building at a constant comfortable temperature during the hot summer months. Resene has also worked to provide clean up methods for those using our products. We provide information to painters on the two container wash system and for those who are painting on commercial sites, we have the Resene WashWise system, which is designed to separate out tool wash water enabling the water to be reused. Sustainable decorating is more than just choosing an Environmental Choice approved paint. It is also making sure that it is applied in an environmentally responsible manner following sustainable principles. The Resene Eco.Decorator programme has been designed to recognise a nationwide network of environmentaly responsible, quality focussed painting contractors. Painting contractors can choose to undergo assessment for the Resene Eco.Decorator programme, which includes assessments of principles in practice, sustainable work practices, waste management, project plans and project sign off processes. Only contractors who successfully meet these standards can promote themselves as an authentic Resene Eco.Decorator. Resene proactively prints colour charts, labels and promotional materials on sustainable paper stocks. Resene colour charts are finished in Environmental Choice approved Resene SpaceCote Low Sheen, Resene Enamacryl Metallic and Resene Non-Skid Deck & Path, while the remainder are finished in waterborne finishes. Not only do the Resene paints give a truer representation of the actual colour, but they also reduce solvent emissions compared to traditional solventborne lacquers often used in international colour chart production. Resene has long recommended the 'two container' system for cleaning decorating tools and accessories as it is easy to do and minimises water and solvent use and continues to do so today. This system is quick and simple and ideal for most projects with no investment other than a couple of large containers. However, for those that prefer to have a wash unit, Resene has created Resene WashWise. The Resene WashWise systems are quick and easy to use with fast separation, and a low quantity of treatment chemicals reducing the materials needed to separate the water and paint. Available in handy Mini size for easy portability or a larger Standard size for use on large projects. With the Resene WashWise system taking care of all waterborne paint wash waste, the Resene 'two container' system can be used to take care of the solventborne wash.
Resene proactively prints brochures, labels, many colour charts, and the Resene News, on sustainable paper stocks, so sourcing sustainable paper stock for our colour charts was a natural step. Resene has worked with its main colour chart supplier, Color Communications, for nearly 18 months to test a vast variety of sustainable paper stocks for durability and aesthetics so that Resene can complete the transition of the last of our charts to sustainable paper stocks. Being the first time that the colour chart supplier had been asked to help develop sustainable stock options, finding paper stocks that would stand up to the demands of colour chart production was a surprisingly slow process with many sustainable paper stocks too lightweight to withstand the twisting and pulling of colour chips. Numerous production trials later stocks have been confirmed and will be in production in late 2007. Resene colour charts are finished in Environmental Choice approved Resene SpaceCote Low Sheen, Resene SpaceCote Flat, Resene Enamacryl Metallic and Resene Non-Skid Deck & Path, while the remainder are finished in waterborne inks. Not only do the Resene paints give a truer representation of the actual colour, but they also reduce solvent emissions compared to traditional solventborne lacquers. This is a stark contrast to overseas colour chart production, where much of the colour chart market is still based on direct deposit colour swatches using solventborne lacquers. With construction waste and building materials making up a major portion of waste going into landfills, many manufacturers are focusing their efforts on finding recycling options. Winstone Wallboards currently has a programme in place where GIB® Board offcuts are crushed then used as a compost additive or applied directly to land as a soil additive. The GIB® Board helps to break down the clay content, particularly useful given that high clay soils are common in many areas. It has been a common misconception that only unpainted GIB® Board could be recycled in this manner. However independent testing commissioned by Resene and Winstone Wallboards has shown this to be a complete fallacy. GIB® Board painted with Resene Environmental Choice paints can be recycled as compost or soil additives in the same manner as unpainted GIB® Board. With the growing demand for green systems, materials recycling and consideration of the whole of life of the material stream, the benefits of specifying Resene Environmental Choice approved paints extend from low or no VOCs on application through to the ability to recycle the plasterboard when future renovations are undertaken. Most Resene interior decorative paints have Environmental Choice approval so you can choose from an extensive range of sheen levels from gloss through to flat to suit your design plans and still enable the plasterboard to be recycled at the end of its useful life in the building. What is Keep New Zealand Beautiful? Keep New Zealand Beautiful provides community-based activities and educational programmes that inspire and motivate New Zealanders to participate in the restoration, enhancement and protection of their local environment. Currently there is a nationwide network of 43 volunteer affiliate programmes working to improve the quality of their local environment. These affiliates work in partnership with local government, business and community organisations on a wide range of projects that including planting, waste minimisation, litter removal and environmental education. Keep New Zealand Beautiful is an umbrella organisation that has since the 1960s co-ordinated the work of hundreds of thousands of volunteers who have worked to improve local environments. The challenge has been to go beyond simply enlisting people to pick up litter and to address the issues that lead to people creating litter in the first place. Resene is proud to support Keep New Zealand Beautiful and has special paint discounts available to approved Keep New Zealand Beautiful projects. To apply, simply send in details of your project to your local Keep New Zealand Beautiful co-ordinator. Join the ALB (Anti-Litter Bug) fanclub  a great way for children to learn how to keep NZ beautiful.